Presently in Yemen, 20 million people depend on humanitarian aid, and the US are helping Saudi Arabia et al bomb the only port left through which that aid can reach them, to smithereens. 8.5 million Yemenis are already starving, and some 3 million of them are children. Where is your outrage over that? Where is the outrage over the American and international treatment of Julian Assange, who has been in the Ecuador embassy in London for six years today? Where is it? Don’t get coaxed into selective outrage by your news media, who like nothing better than to tell you what to be outraged by, and what not. If you allow that to happen, you have lost your freedom and your independence. Ask why they tell you a certain story at the moment they tell it. Ask why they tell it the way they do. Yes, it has come to this. Every single story you read or hear needs to be scrutinized. Because there’s an agenda behind all of them, left, right or middle. And because the media have figured out that constantly driving you from one selective outrage to another is very profitable for them. Critical thought is not. Yes, there are sociopaths in the Trump administration. But that’s nothing new. There have been sociopaths in every administration. It’s how our political systems work. Sh*t floats to the top. Yes, US border policies have intensified. But whatever you think of that, migrants and refugees are not a new issue. Nor are the reasons why people flee their homes and communities. Whether it’s Africa or Central America, people flee because of what western governments, military and intelligence services have done to their homelands. And until we stop doing that, they will keep coming. So much of our prosperity and power is derived directly from other people’s poverty and despair. So much of our wealth has been stolen from other people’s resources. If you want to be outraged at something or someone, start with yourself. Start thinking. What is happening today is awful. But so many awful things happened in the past that you never showed outrage about. And yet these things are all inextricably linked. One leads to another. America shouldn’t be outraged about Trump without being outraged about its entire political system, and all of its actors. Without that, outrage about Trump has no meaning, and will lead to nothing at all. Or rather, it will lead to a more divided country, full of people played for profit and political games. The US invasion of Vietnam ended to a large extent because of protests in the streets. Perhaps that is what is needed once again. But the underlying issues, the ones that had led to the invasion in the first place, were not solved then. And that is what it is all about. Nor is it an American problem per se. Europe is just as culpable. Children drowning, children in cages, what’s the difference, in the end it all comes from the same mindset. Which needs a radical reset. But what are the odds of that happening? Our cultures are based on exploiting other peoples and nations, and then telling ourselves we deserve what we have. How are you going to change that? The only way to resolve the global refugee problem is to make sure people have a future where they are born. And the only thing we actually do is to make that impossible. Mom and pop get squeezed again. The stock-market rally presents a difficult choice for some individual investors: Miss out or risk getting in at the top. The scars of the financial crisis have left many wary, even as the second-longest bull run in S&P 500 history has added more than $14 trillion in value to the index since it bottomed in March 2009, according to S&P Dow Jones Indices. Yet there are signs that caution is dissipating. Investors have poured money into stocks through mutual funds and exchange-traded funds in 2017, with global equity funds posting record net inflows in the week ended March 1 based on data going back to 2000, according to fund tracker EPFR Global. Inflows continued the following week, even as the rally slowed. The S&P 500 shed 0.4% in the week ended Friday. The investors’ positioning suggests burgeoning optimism, with TD Ameritrade clients increasing their net exposure to stocks in February, buying bank shares and popular stocks such as Amazon.com and sending the retail brokerage’s Investor Movement Index to a fresh high in data going back to 2010. The index tracks investors’ exposure to stocks and bonds to gauge their sentiment. “People went toe in the water, knee in the water and now many are probably above the waist for the first time,” said JJ Kinahan at TD Ameritrade. That brings individual investors increasingly in line with Wall Street professionals. A February survey of fund managers by Bank of America Merrill Lynch found optimism about the global economy improving while investors were holding above-average levels of cash, leaving room for them to drive stocks still higher. Bullishness among Wall Street newsletter writers reached 63.1%—the highest level since 1987—a week ago in a survey by Investors Intelligence, before falling to 57.7% this past week. Overall investor sentiment is strong right now for the U.S. stock market, said Ann Gugle, principal at Alpha Financial Advisors. She pointed to a typical growth-and-income portfolio with 70% in stocks and 30% in bonds and alternatives. The 70% allocation to stocks, she said, would ordinarily be evenly split between U.S. and international stocks, but for the past three years it has shifted about 40% to U.S. stocks and 30% international. 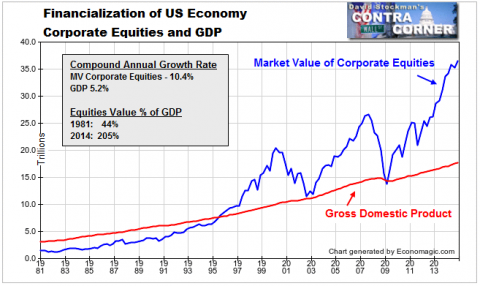 “The Most Broadly Overvalued Moment in Market History”. Time for public transport investments, Donald. U.S. subprime auto lenders are losing money on car loans at the highest rate since the aftermath of the 2008 financial crisis as more borrowers fall behind on payments, according to S&P Global Ratings. Losses for the loans, annualized, were 9.1% in January from 8.5% in December and 7.9% in the first month of last year, S&P data released on Thursday show, based on car loans bundled into bonds. The rate is the worst since January 2010 and is largely driven by worsening recoveries after borrowers default, S&P said. Those losses are rising in part because when lenders repossess cars from defaulted borrowers and sell them, they are getting back less money. A flood of used cars has hit the market after manufacturers offered generous lease terms. Recoveries on subprime loans fell to 34.8% in January, the worst since early 2010, S&P data show. With losses increasing, investors in bonds backed by car loans are demanding higher returns, as reflected by yields, on their securities. That increases borrowing costs for finance companies, with those that depend on asset-backed securities the most getting hit hardest. American Credit Acceptance, one of nearly two dozen subprime lenders to securitize their loans in recent years, had one of the highest cost of funds last year with yields on its securitizations as high as 4.6%, even as the two-year swap rate benchmark hovered around 1%, according to a report from Wells Fargo. The company relies heavily on asset-backed securities for funding. 2nd article in a row that ends with “Since The Financial Crisis”. [..] something more concerning emerges when looking at the annual change in the rolling 12 month total. It is here that we find that, like last month, in the LTM period ended Feb 28, total federal revenues, tracked as government receipts on the Treasury’s statement, were $3.275 trillion. This amount was 1.1% lower than the $3.31 trillion reported one year ago, and is the third consecutive month of annual receipt declines. This was the biggest drop since the summer of 2008. At the same time, government spending rose 3.8%. Why is this important? Because as the chart below shows, every time since at least 1970 when government receipts have turned negative on an annual basis, the US was on the cusp of, or already in, a recession. Indicatively, the last time government receipts turned negative was in July of 2008. One potential mitigating factor this time is that much of the collapse in receipts is due to a double digit % plunge in corporate income tax, which begs the question what are real corporate earnings? While we hear that EPS are rising, at least for IRS purposes, corporate America is in a recession. How about that far more important indicator of overall US economic health, and biggest contributor to government revenue, individual income taxes? As of February, the YTD number was $611bn fractionally higher than the same period a year ago, and declining. Finally should Trump proceed to cut tax rates without offsetting sources of government revenue, a recession – at least based on this indicator – is assured. The speculation over whether Trump would or would not fire the US attorney for the Southern District of New York, Preet Bharara, who earlier reportedly said he would not resign on his own, came to a close a 2:29pm ET when Preet Bharara, tweeting from his private Twitter account, announced he had been fired. “I did not resign. Moments ago I was fired. Being the US Attorney in SDNY will forever be the greatest honor of my professional life.” Bharara’s dismissal ended an “extraordinary” showdown in which a political appointee who was named by Mr. Trump’s predecessor, President Barack Obama, declined an order to submit a resignation. “I did not resign. Moments ago I was fired. Being the US Attorney in SDNY will forever be the greatest honor of my professional life,” Mr. Bharara wrote on his personal Twitter feed, which he set up in the last two weeks. Bharara was among 46 holdover Obama appointees who were called by the acting deputy attorney general on Friday and told to immediately submit resignations and plan to clear out of their offices. But Bharara, who was called to Trump Tower for a meeting with the incoming president in late November 2016, declined to do so. As reported previously, Bharara said he was asked by Trump to remain in his current post at the meeting. Bharara met with Trump at Trump Tower, and then addressed reporters afterward. Before the firing, one of New York’s top elected Republicans voiced support for Bharara on Saturday. The Southern District of New York, which Bharara has overseen since 2009, encompasses Manhattan, Trump’s home before he was elected president, as well as the Bronx, Westchester, and other counties north of New York City. Last weekend, Trump accused Barack Obama of wiretapping Trump Tower in Manhattan, an allegation which various Congressmen have said they will launch a probe into. And now the speculation will begin in earnest why just three months after Bharara, who at the time was conducting a corruption investigation into NYC Mayor Bill de Blasio as well as into aides of NY Gov. Andrew Cuomo, told the press that Trump had asked him to “stay on” he is being fired and whether this may indicate that the NYSD has perhaps opened a probe into Trump himself as some have speculated. Don’t look at me, I didn’t write the book. Millennials have a reputation for being entitled, self-absorbed and lazy, but a new book argues that their parents are actually a bigger danger to society. In “A Generation of Sociopaths: How the Boomers Betrayed America,” Bruce Cannon Gibney traces many of our nation’s most pressing issues, including climate change and the rising cost of education, back to baby boomers’ idiosyncrasies and enormous political power. Raised in an era of seemingly unending economic prosperity with relatively permissive parents, and the first generation to grow up with a television, baby boomers developed an appetite for consumption and a lack of empathy for future generations that has resulted in unfortunate policy decisions, argues Gibney, who is in his early 40s. (That makes him Generation X.) “These things conditioned the boomers into some pretty unhelpful behaviors and the behaviors as a whole seem sociopathic,” he said. The book comes as Americans of all ages are sorting through a new political reality, which Gibney argues that boomers delivered to us through years of grooming candidates to focus on their political priorities such as, preferential tax treatment and entitlement programs, and then voting for them in overwhelming numbers. Though these circumstances are new, making the argument that a generation – particularly boomers – are to blame for society’s ills is part of a storied tradition, said Jennifer Deal, the senior research scientist at the Center for Creative Leadership. “There are a lot of people who like to blame the baby boomers for stuff and this has been going on for as far as I can tell since the late 60s,” Deal said. Indeed, a 1969 article in Fortune magazine warned that the group of then-20-somethings taking over the workplace were prone to job-hopping and having their egos bruised. If that sounds familiar, it’s probably because it is. There’s no shortage of articles describing millennials similarly. Both are indicative of a natural human tendency to want to explain the world and other people through the lens of group mentalities, said Deal. “Everybody can think of someone older or someone younger who has done something annoying,” she said. “Everybody likes a good scapegoat.” Still, Gibney, a venture capitalist, argues there is something inherently different about the boomers from the generations that preceded them and those that followed: a sense of entitlement that comes from growing up in a time of economic prosperity. Rotterdam was absolutely flattened by Nazi bombers. Turkey told the Netherlands on Sunday that it would retaliate in the “harshest ways” after Turkish ministers were barred from speaking in Rotterdam in a row over Ankara’s political campaigning among Turkish emigres. President Tayyip Erdogan had branded its fellow NATO member a “Nazi remnant” and the dispute escalated into a diplomatic incident on Saturday evening, when Turkey’s family minister was prevented by police from entering the Turkish consulate in Rotterdam. Hundreds of protesters waving Turkish flags gathered outside, demanding to see the minister. Dutch police used dogs and water cannon early on Sunday to disperse the crowd, which threw bottles and stones. Several demonstrators were beaten by police with batons, a Reuters witness said. They carried out charges on horseback, while officers advanced on foot with shields and armored vans. The government said it saw the potential to import divisions into its own Turkish minority, which has both pro- and anti-Erdogan camps. Dutch politicians across the spectrum said they supported Prime Minister Mark Rutte’s decision to ban the visits. In a statement issued early on Sunday, Prime Minister Binali Yildirim said Turkey had told Dutch authorities it would retaliate in the “harshest ways” and “respond in kind to this unacceptable behavior”. Turkey’s foreign ministry said it did not want the Dutch ambassador to Ankara to return from leave “for some time”. Turkish authorities sealed off the Dutch embassy in Ankara and consulate in Istanbul in apparent retaliation and hundreds gathered there for protests at the Dutch action. The curious story of Mr. Flynn. Former National Security Advisor Michael Flynn was attending secret intelligence briefings with then-candidate Donald Trump while he was being paid more than half a million dollars to lobby on behalf of the Turkish government, federal records show. Flynn stopped lobbying after he became national security advisor, but he then played a role in formulating policy toward Turkey, working for a president who has promised to curb the role of lobbyists in Washington. White House spokesman Sean Spicer on Friday defended the Trump administration’s handling of the matter, even as he acknowledged to reporters that the White House was aware of the potential that Flynn might need to register as a foreign agent. In the documents, the Flynn Intel Group asserts that it changed its filings to register as a foreign lobbyist “to eliminate any potential doubt.” “Although the Flynn Intel Group was engaged by a private firm, Inovo BV, and not by a foreign government, because of the subject matter of the engagement, Flynn Intel Group’s work for Inovo could be construed to have principally benefited the Republic of Turkey,” the filing said. The firm was paid a total of $530,000 as part of a $600,000 contract that ended the day after the election, when Flynn stepped away from his private work, the documents say. During the summer and fall, Flynn, the former director of the Defense Intelligence Agency, was sitting in on classified intelligence briefings given to Trump. Funniest movie review in a while. Only 38 people turned up at screen 7 of Berlin s Alhambra cinema on Thursday night to watch a powerful Turkish president make a pitch for why he deserves even more power. But those who came were impressed. Reis (the Turkish word for chief), a biopic in which Recep Tayyip Erdogan is played by soap opera star Reha Beyoglu, premiered in Istanbul last month. It is now touring cinemas among Europe s Turkish diaspora communities in the run-up to the constitutional referendum on 16 April, a vote that could boost Erdogan’s powers and allow him to remain president until 2029. The film shows the co-founder of Turkey s ruling Justice and Development party (AKP) growing up in Istanbul’s working class Kasimpasa neighbourhood to become a man of prodigal talent and saintly self-denial, scoring the last-minute winner in a five-a-side football match with an overhead kick and getting up in the middle of the night to rescue a puppy that has fallen down a well. His supporters are willing to use blunter means to defend their chief against Turkey s cosmopolitan elite. In the film s final scene, showing one of Erdogan’s guards punching an assailant in the face, the Berlin audience watching the film with German subtitles broke into spontaneous applause. The dialogue was widely understood to be a reference to last July s averted coup: Who are you? asks the assailant. The people, the guard replies. Smoking cigarettes on the pavement outside the cinema, a group of four Turkish-Germans in their late teens said Reis had only affirmed their decision to vote yes in the referendum. A strong Erdogan is good for a strong Turkey, said Ahmet, 19. Tensions between the German and Turkish governments, triggered by the arrest of Die Welt s correspondent Deniz Yucel and culminating in Erdogan accusing Germany of Nazi practices over banned rallies in German cities, had merely strengthened his allegiance, said 20-year-old Mehmet. To be honest, when America, Germany and France tell me to vote no in the referendum, then I am going to vote yes. Both said no German party represented their interests: We are just foreigners to them. The heightened fervour of support for Erdogan even among younger members of Germany s population with Turkish roots, a community of about 3 million, of which roughly half are entitled to vote in April has scandalised the country’s public and media. German politicians allege that the AKP is trying to influence the diaspora vote not just through public rallies but by covertly pressurising and threatening its opponents in Germany via religious and business networks. In January, Turkish-German footballer Hakan Calhanoglu was publicly criticised by his club Bayer Leverkusen for posting a video on social media in which he declared his allegiance with the evet (yes) camp. You are part of our country, Angela Merkel, the chancellor, appealed to the Turkish-speaking community on Thursday. We want to do everything to make sure that domestic Turkish conflicts aren’t brought into our coexistence. This is a matter of the heart for us. The cavernous halls of Athens’ central civil court are usually silent and sombre. But every Wednesday, between 4pm and 5pm, they are anything but. For it is then that activists converge on the building, bent on stopping the auctions of properties seized by banks to settle bad debts. They do this with rowdy conviction, chanting “not a single home in the hands of a banker,” unfurling banners deploring “vulture crows”, and often physically preventing notaries and other court officials from sitting at the judge’s presiding bench. “Poor people can’t afford lawyers, rich people can,” says Ilias Papadopoulos, a 33-year-old tax accountant who feels so strongly that he has been turning up at the court to orchestrate the protests with his eye surgeon brother, Leonidas, for the past three years. The protests have been highly effective. In law courts across Greece, similar scenes have ensured that auctions have been thwarted. Activists estimate that only a fraction of auctions of 800 homes and small business enterprises due to go under the hammer since January have actually taken place. Under pressure to strengthen the country’s fragile banking system, Athens’ leftist-led government has agreed to move ahead with around 25,000 auctions this year and next. In recent weeks they have more than doubled, testimony, activists say, to the relaxation of laws protecting defaulters. “There is not a Greek who does not owe to the banks, social security funds or tax office,” says Evangelia Haralambus, a lawyer representing several debtors. Jean Claude Juncker held a speech yesterday that had, oh irony, been labeled a State of the Union. A perfect way of showing how pompous Juncker and his surroundings have become. A perfect way, too, to point out how much the European Union differs from the United States. The gap is so wide it doesn’t need any explaining. Much of the speech concerned the refugee crisis Juncker and his cronies share a lot of the blame for, and for good measure he managed to get in a vile threat to Greece, in the vein of “Greece must respect the bailout, or the EU reaction will be ‘different'”, and “Greece cannot be kept in the euro at all costs”. In Brussels, democracy is a word fast losing even the last shreds of its meaning. Juncker’s a very boring speaker -when he’s not been drinking-, but that doesn’t take away from the message. Brussels seeks to use the refugee crisis for the same purpose it uses all crises for: power grabbing. A reaction from Nigel Farage that was dripping with vile bigotry was the best reaction I read about to the speech, and in my not so humble opinion that is desperately sad. It’s a shame and a disgrace that bigots like Farage, Le Pen, Orban and Wilders will have to decide the future of the EU, but it’s still a mile and a half better than more EU, because the European Union is rapidly turning into a monstrosity the likes of which even Europe has seldom seen in its history, and that’s saying something. 28 separate formerly sovereign nations are coming under the thumb of a de facto occupying force that is squeezing their sovereignty and democracy out of them in boa constrictor fashion, leaving them behind as empty political shells. And every single one of these nations has voluntarily signed up for this treatment, blindly lured by financial promises that the Greek crisis has abundantly exposed as hollow and void. Brussels has created another crisis. No, the refugee situation didn’t start last week and yes, the EU did nothing for months, other than shutting down Italy and Greece’s own refugee aid programs and replacing them with the very suspicious Frontex bureau. And now this crisis is in full flight, what does Juncker call for? More EU, more Union. Which means more power moving to Brussels. This is an MO, not an unfortunate accident. The Europe of Juncker, Merkel, Cameron and Hollande could and should have moved much faster on the refugee issue, and not have let thousands of people drown before coming up with the plan Juncker presented yesterday, which comes up way short of what will be needed, but which some Reuters editor still had the audacity to label ‘bold’. A grand resettlement plan for 160,000 refugees makes no sense at all at a time that Germany alone will receive perhaps as much as a million refugees this year. The best thing about the plan may turn out to be the compulsory character Juncker seeks to give it, complete with sanctions for countries that refuse to be told by him what to do. Even better, obviously, is the fully braindead idea of letting countries pay NOT to accept refugees. Once you start translating human misery into monetary terms, your only possible future looks excruciatingly bleak. But it will be a spectacle to watch, Brussels dictating terms on sovereign countries, or countries that still think they are sovereign at least. Brussels succeeded in getting all EU nations to gang up on Greece earlier this year, and countries that are non-compliant on the refugee issue are going to receive death threats like the ones Greece received, but the 27-to-1 majority that existed in that case will not repeat itself. There is not much difference in depth of bigotry and opportunism between Juncker, Farage and Le Pen. So perhaps it’s only fitting that they get to fight to secure the end of the grandiosely ill-conceived pan-European project amongst themselves. There are no other voices left, no reason, no moderation, no common sense. Europe’s left is all but dead from largely self-inflicted wounds, set in motion by the likes of Tony Blair. That leaves just one voice, that of the sociopaths, the type of individual overly large institutions select for by default. If Brussels and Juncker have their way, the EU is going to turn Europe into a -perhaps guerrilla- warzone, of occupiers and occupied battling for power. If the European Union is dissolved, the sovereign nations that remain behind may yet have a -fighting- chance. The refugee crisis has shown us, and in rich colors, that there are still a lot of decent people in Europe. The problem is that they have no political voice. The dissolution of the Union may be the best -if not only- way to return that voice to them. Separate sovereign countries with decision making and accountability on a smaller and therefore more human scale are much less likely to draw sociopaths into leading positions. The carefully re-crafted relationship with Russia, which took 25 years to build, was destroyed again in hardly over a year, something for which Angela Merkel deserves so much blame it may well end up being her main political legacy. But the biggest failure is not even in politics outside of its own territory. The union rots from within. Which starts with its moral bankruptcy, obviously. If you allow yourself to be an active accomplice in the death of over 6000 East Ukrainians, and you simply look away as thousands of migrants die in the seas off your shores, it should not be surprising that you just as easily allow for a humanitarian crisis, like the one in Greece, to develop within your own borders. It comes with the territory, so to speak. What will undo Europe from within is its economic policies. Which are strongly linked to the same moral values issue: inside a union, you cannot let thousands of people go without food and health care while others, a few hundred miles away, drive new Mercs and Beamers over a brand new Autobahn. That’s not a union. That’s a feudal society. Though it may look out of far left field for those of us -and there are many- who think in economic and political terms only, we cannot do without a conscious definition of a social contract. We need to address the role of compassion, morals, even love, in our societies. If Jesus meant anything, it was that. There have been times through history when this subject would have been much easier to breach, but we today almost seem to think they are irrelevant, that we can do without them. We can’t. But in the US, people get killed at traffic stops every day, and in Europe, they die of sheer negligence. Developments like these will lead to ‘centers that cannot hold’. In that part of the media whirlwind that we at the Automatic Earth expose ourselves to, virtually all discussions about our modern world, and what goes wrong with it, which is obviously a whole lot, are conducted in rational terms, in financial and political terminology. But that’s exactly what we should not be doing. Because it’s never going to get us anywhere. In the end, let alone in the beginning too, we are not rational creatures. And if and when we resort to only rational terms to define ourselves, as well as our world and the societies we create in that world, we can only fail. For a society to succeed, before and beyond any economic and political features are defined, it must be based solidly on moral values, a moral compass, compassion, humanity and simple decency among its members. And those should never be defined by economists or lawyers or politicians, but by the people themselves. A social contract needs to be set up by everyone involved, and with everyone’s consent. Or it won’t last. How and why that most basic principle got lost should tell us a lot about where we are today, and about how we got here. Morals seem to have become optional. The 40-hour death struggle of Cecil the lion exemplifies that pretty well. And no, his is not some rare case. The lack of morals involved in killing Cecil is our new normal. In the US, these values seem to have long since disappeared from very substantial segments of society. A closer look would seem to teach us that this is largely because of the top down approach that comes with an oversized government apparatus that seeks to rule over what are today some 320 million people. There are multiple reasons why such a government can’t work to make a society successful. First, there are far too many people to rule over; the human brain can’t conceive, other than in completely abstract terms, of meaningful human contact, in whatever shape or form, let alone of compassion, between such numbers of people. The Catholic church, for all its failures, did succeed in binding a society together, and repeating that across many societies, but it never endeavored to gain control of every single political and economic system. Washington does. Making morals optional necessarily means they will vanish. All strong societies through history had strong and binding social contracts. Less successful ones did not. We, however, have only financial and legal contracts left, no social ones other than those that are almost entirely optional. We ourselves cannot kill people at will, but our governments can. We -apparently- can still kill lions, though. The second most important reason why the US, and now the EU with it, are destined to fail, is that their structures, which with the numbers of people involved must of necessity become less democratic with time, inevitably slide into selecting for the exact wrong kind of people, as I’ve often argued before. Societies this size inevitably select for power hungry sociopaths; there is no other option. It’s a process we even see also in smaller scale societies today. With the advent of serious attempts to utilize Freud’s theories for penetrating people’s unconscious minds, picked up by Goebbels and since perfected by secret services, spin doctors and ad agencies, the world has become a whole other place. Even if most haven’t noticed. The curious thing is that many separate EU nations for many years did have such compassion and humanity. Which these days are often mistaken for socialism. Which in turn, if we may believe the majority of pundits, is about the worst principle a country can pick to build its society on. In reality, though, most of it has always simply been a matter of precisely that by which we can, should, judge a society’s success and viability: the extent to which it cares for its weakest and most vulnerable. That in some cases this has perhaps been taken too far, doesn’t change the fact: we still can’t call a society successful that leaves its weakest to starve by the curb. And it doesn’t matter how much distorted Darwinism and Ayn Randism and neo- or ordo-liberalism one may wish to throw at it. A successful society must take care of all of its members to the extent that it can. Simply because man is a social animal. Still, the principle of compassion seems to have all but vanished with the development of the European Union. And if there’s one main reason why that Union is doomed to fail, it’s that. It’s not the failed economic policies, it’s not even the increasing power politics that doom it: it’s the relentless drive towards a group of individuals seeking the power to manipulate millions of people they never met, with impunity. The divergence between individual European nations and the Union seated in Brussels is also the source of much of the division between both. Greece doesn’t want to let its people slide into further misery. Brussels couldn’t care less: Athens has to stick to rules and regulations no matter how many of its children go hungry or how many of its elderly pass away from entirely preventable afflictions. It’s right there, in that division, that the EU is blowing up itself. You can’t have a viable political or economic union if you don’t take care of the weakest. Thing is, once you got the sociopaths in charge, the inevitability of the process of losing and eroding a social contract gets ignored. Unless and until the people in the streets pick it up again. No, the biggest issue in Europe is not whether the Union moves toward even closer ties. The biggest issue is that the Union is morally deficient in its core. Ironically, it’s the Greek people who understand much better than the Dutch and Germans that “without love, it ain’t much”. And they are labeled a less developed society for it. While the less fortunate in Berlin, Paris and Amsterdam continue to receive relatively generous welfare and other benefits, certainly compared to their Greek peers. A two-tier union is not some future concept, it’s here. And it’s not just Greece. The embarrassing situation with the refugees at Calais is due to the exact same moral quicksand. David Cameron is going to send “dogs and fences”. He’s going to send in dogs to ‘fight’ against people! We’ve seen that kind of thing before. And the military can’t be far behind. It’s the only answer a certain class of people manage to come up with. After they’ve ignored and tried to wish away an issue they should long have tackled. It’s only when British tourists and truck drivers start complaining that Cameron ‘acts’. The refugees have been at Calais for a long time, during which no. 10 did nothing at all. Just as disgraceful is the influx of African and Asian refugees on Greek islands that Brussels refuses to do anything about. The Greek population try to do what they can, as do the Italians. But their budgets are all in EU hands now, and Brussels doesn’t care. The EU’s only response is force, not compassion or moral values. There are mass migrations going on in many parts of the world. They are the inevitable result of the means of mass transportation and mass communication we developed. We have two options: either we facilitate for the inclusion of the refugees in our societies, or we actively help develop their homelands. If we don’t, they will still keep coming, and things will get ugly. Whichever choice we make, we need to do it in a spirit of humanity. We can’t turn our back on these people, not the Greeks, not the refugees, that can only come back to haunt us. And besides, we don’t have the -moral- right. In the meantime, don’t let’s forget that the number of refugees in Calais pales in comparison to the numbers that land in Greece on a daily basis. The governments that represent us put us to shame as human beings. But in the end it’s us, ourselves, who allow them to do it. Again, this is not optional. We can either get this right, or we’ll descend into chaos. Something many of our ‘leaders’ would not only welcome, but are actively instigating. It’s up to us, and that means you too, to keep them from doing it. Take a look at the black kids getting killed in the US, look at the Greek children and grandmas who don’t have medicine or food, look at the refugees that are part of today’s mass migration, and who get dogs send in against them, look at all the areas in the world where our -western- interference has caused mass misery for profit, and if you still don’t get it, take a look at Cecil, and what his death symbolizes about our societies and values. Societies which we are all part of, and values we should share in order to maintain our societies as going concerns. We may well have just one last chance to get it right. But that chance is fading as fast as our penchant for compassion. The lunatics have truly taken over. French Economy Minister Emmanuel Macron and German Vice-Chancellor Sigmar Gabriel published a piece in the Guardian last week that instantly revived our long nourished hope for the European Unholy Union to implode and be dissolved, sooner rather than later. The two gentlemen propose a ‘radical’ reform for the EU. Going a full-tard 180º against the tide of rising euroskeptism, the blindest bureaucrats in European capitals are talking about more centralization in the EU. Here’s hoping that they follow up with all the energy they can muster, and that we’ll hear a lot more about the ‘reforms’ being proposed. Because that will only serve to increase the resistance and skepticism. Let them try to ‘reform’ the EU. We’re all for it. If only because if they do it thorough enough, referendums will be required in all 28 member nations, which all need to agree, in a unanimous approval vote. The gents know of course that that is never ever going to happen. So sneaky ways will have to be found. Something Brussels is quite experienced at. They’ve shown many times they won’t let a little thing like 500 million citizens get in their way. We’re curious to see what they’ll come up with this time. Meanwhile, though, the rising skepticism threatens to rule the day in many countries, and Greece is by no means the leader in the field. Germany has a rising right wing party that wants out (just wait till Merkel leaves). Marine Le Pen has vowed to take France out as soon as she gets to power, and she leads many polls. Britain’s Ukip is merely the vanguard of a broad right wing UK ‘movement’ that either want out or have treaties thoroughly renegotiated. Portugal’s socialists are soaring in the polls on an EU-unfriendly agenda. Spain’s Podemos is no friend of Brussels. In Italy, M5S’s Beppe Grillo has gone from skeptic to outright adversary over the past few years. There are varying levels of antagonism in all other countries too. Now obviously, not all countries in the union carry the same weight, politically speaking (why do we so easily agree that’s obvious, though?). You have Germany, then a big nowhere, then France and Britain. Greece, equally obviously, has no say. They can elect a government that wants to change things even just at home, and be told no way. If Germany would elect such a party, all EU policy would change in the blink of an eye. A true union of sovereign nations it therefore is not. And that of course was never possible, it was just something people wished for who never contemplated the details or consequences. Still, given that the whole project has always been represented as a one-way street from which escape is not possible, the weight of the smaller nations should not be underestimated. Perhaps all it will take is one defector to make the entire edifice unstable. Statements to the contrary are made only by people who eat hubris for breakfast, lunch and dinner. If either France or Germany leave -the former looks far more likely right now-, it’s project over. The same would probably hold for Italy. Spain would be a grave blow. Britain might be quite a bit easier (no euro), though negotiations -let alone referendums- over treaties could cause a lot of havoc and unrest. While various bigwigs try to fool you into thinking that letting small nations leave can be ‘ringfenced’, that is utter nonsense, they have no way of knowing. David Cameron tries to convince himself that he can get away with establishing some sort of status aparte for Britain, but others may want such a status too, and they may have a list of points they want to discuss if and when treaty changes are put on the table. Multiple that by 28 and before you know it either nothing changes, or everything does. The Union was hastily and sloppily cross-stitched together when everyone was still exclusively dreaming more of mass lift-all-boats profits in the offing, than caring about the fineprint of compromise squared treaties or considering possible future consequences if and when the profits would turn out not to be unlimited. Ergo, everything that happens now is an improvised play performed by 28 at best mildly talented actors trying to convey an air of confidence. That’s all that is left. “What’s important is the project,” Macron said in an interview with Le Journal du Dimanche. “Treaty change is a method that would ensue and that we have to prepare in due time,” he said, warning that European people would probably reject a new treaty if asked in a referendum. Meanwhile, British demands to opt-out from “ever closer union” could be accommodated by a special “protocol” to the EU treaties, according to Manfred Weber, a Christian Social Union MEP who is a close ally of German Chancellor Angela Merkel. But in return, Britain would have to accept losing its veto in areas where others forge ahead with deeper integration, the German MEP warned. In 2005, both France and Holland rejected the EU constitution in respective national referenda. But Brussels just ‘forged’ ahead as if it didn’t matter. Today, however, let’s see them try that again. Ten years ago, the profits were still in vogue. But things have changed, and problems are everywhere. Problems that Brussels seeks to ‘solve’ by gifting itself with ever more centralized powers. But the undoubtedly biggest problem of all they have is that not 10% of Europeans would vote to give them these powers. So please, please, try. As for Greece, all the negotiations really are just a matter of fiddling while Rome burns. But that is not because Greece is in trouble; it’s because of what the EU has become. A club that depends on its ability to scare members into submission, the same vein the IMF operates in. The negotiations are about amounts of debt that were imposed upon Greece by the troika when it decided to bail out banks of Europe’s most powerful member nations and put the Greek people on the hook. Europe’s high and mighty will yet come to regret the decision not to restructure these banks, because this will be the catalyst that blows up the Union. The reason why will become apparent as debt rises further and asset markets start falling off so many cliffs. Greece should get out as fast as it can, all member countries should, especially the poorer ones. There is no benign or even economically viable future for any of them in the Union. A future inside the union is infinitely more frightening than one outside. What is evident by now is that the troika creditors don’t come to the table to negotiate, they come to impose their will. And those countries that carry the most debt are most vulnerable to the threats flung across the table. If you don’t get out, in time Germany will decide what you can eat, what your children learn in school, and how you are to behave. You will no longer live in sovereign nations. The eurozone must fail. And so must the EU. That is better for everyone who’s not inside the power circles, in the long term. What countries should do now is ‘ringfence’ themselves as best they can from the nuclear fallout the failure will lead to. Focus on resilience. While the leadership everywhere dreams of ever more centralized power, economic reality dictates decentralization. It can only be halted through propaganda and violence. But that will merely be temporary. Even if Brussels somehow ‘solves’ the Greece issue, others nations will follow, be targets of financial markets, and once it comes to Italy or Spain, who are both in very precarious places, the EU and the ECB are simply not strong enough to absorb the blow. And then where do you think that leaves you? I’ve said many times before that all governments, power structures and supra-national organizations are a magnet for the last people you would want to lead them: sociopaths. That’s not an opinion, it’s a description of the dynamics of human group psychology. Greece itself before Syriza is a prime example of this. The smaller the countries, states, regions that politicians are allowed to rule over, the less likely leadership posts are to attract sociopaths. Other considerations count too, remuneration, chances to forge ties with an elite and serve their purposes. Larger entities are certain to attract pathological minds. Exceptions to the rule are far and few between. Also: the more a society manages the field of propaganda, the likelier it is to get -and keep- a sociopath as its leader. The US is a good example. So is the EU. And obviously, the IMF, World Bank, NATO, FIFA. We always fail at ‘doing large scale’ for the benefit of the people. The large the scale, the less the people benefit. Just when its moment of glory seems to arrive, globalization will lead towards decentralization and protectionism. Just as stability leads to instability. The EU’s socio-pathological trait is evident in the way the organization’s leaders deal with Ukraine, with the refugees off its southern coasts, and, inside its very borders, with Greek society, unemployment, hunger and hospitals. There is no compassion, no conscience. Is The European Union Already On The Brink Of Inevitable Disaster? The fact of the matter is that a free-trade zone in which the black hole at the centre, Germany, absolutely overwhelms all of its competition, and the competition can’t protect itself, is untenable. [..] many of the great ideas that the European Union began with have turned, as it frequently happens in history, into the problems. Q: [..] ..you said a group of squabbling nations, and you’ve alluded to the history, from the Franco-Prussian wars right up to 1945, the history is very, very unpleasant indeed. Is the corollary that Europe will eventually descend back into war? George Friedman: Well, the question is really has it ascended? From ’45 to ’92, Europe was occupied by the Soviets and the Americans. The fundamental questions of sovereignty were not in the hands of London or Berlin or Rome, it was in the hands of Washington and Moscow. In ’92, the Soviet Union collapsed, and for the first time since WWII, Europe became genuinely sovereign. And for 16 years, they made a go of it. For the last seven years, it’s been rather disastrous, and the question is, can they reverse it? And if they don’t reverse it, what prevents them from returning to the kind of history that is normal in Europe? And what I’m arguing is that basically, the period of ’92 to 2008 was an interesting aberration. We are now back to the old normal, and how bad it becomes really depends on a bunch of (inaudible) issues. But first we have to really recognise that the Europe that was envisioned in the European Union is not going to return. We had better not forget that. If Europe will never be what it was supposed to be, then why would anyone want to be part of it, apart from the few that profit most? If the corollary truly is that Europe will eventually descend back into war, isn’t it time to take care of your own? And isn’t that, really, what the Greeks are already trying to do today? [..] most people in any given country seem to believe that the political parties that rule them do not collude in their own collective interest and against the best interests of their respective constituents. Similarly, they are unlikely to accept that fascism exists in their country—that members of their favoured party collude with industries. Further, most people seem to disbelieve that the leaders of their own country collude with the leaders of their country’s enemies in such a way that might create loss or danger to their own people. This is naive. Such collusions are the norm rather than the exception. Those who tend to be more informed, readily acknowledge that collusion exists between all of the above, to one degree or another. If this group errs, it is often in the opposite assumption—that the collusion is all-encompassing. There can be no doubt that a New World Order is being sought by some—this has been made clear for at least a hundred years by many who regard themselves as an Elite. It is therefore an open secret. In my experience in dealing with political leaders (and political hopefuls) from several jurisdictions, I’ve found there to be a consistent sociopathology (by definition, the desire for dominance over others, undeserved self-confidence, lack of empathy, a sense of entitlement, lack of conscience, etc.). Sociopaths are drawn to political leadership for obvious reasons. First, they’re prone to collusion, as they recognise that it may further their interests [..] Trouble is, the same sociopathology would drive the same individuals to seek to dominate each other. It has been postulated by many that those who see themselves as an Elite are nearing the completion of what they perceive as world dominance. However, should they succeed, they will betray their partners the very next day, as it’s their nature to do so. First, there most assuredly are extremely domineering forces (regardless of how closely associated they might be), which, in the near future, will do immense damage to the cause of freedom in the world, particularly in those countries where they are most dominant, or will become most dominant. Second, the situation does appear to be reaching a head. The two greatest uncertainties will be how much damage will be done before the dust has settled, and how protracted the period of destruction and struggle for dominance might be. [..] The best that can be done is to work at placing ourselves as far outside of their sphere of influence as possible. That describes how the EU functions, and why Greece -first of all, and first thing in the morning- needs to leave. There is no future in the EU that anyone wants to live in. It’s not a tide that will lift all boats, it will sink them. During the 27 years after Alan Greenspan became Fed chairman in August 1987, the balance sheet of the Fed exploded from $200 billion to $4.5 trillion. Call it 23X. Let’s see what else happened over that 27 year span. Well, according to Forbes, Warren Buffet’s net worth was $2.1 billion back in 1987 and it is now $73 billion. Call that 35X. During those same years, the value of non-financial corporate equities rose from $2.6 trillion to $36.6 trillion. That’s on the hefty side, too—- about 14X. Next we have wage and salary compensation, which rose from $2.5 trillion to $7.5 trillion over the period. Make that 3.0X. Then comes the median nominal income of US households. That measurement increased from $26K to $54K over the period. Call it 2.0X. Digging deeper, we have the sum of aggregate labor hours supplied to the nonfarm economy. That metric of real work by real people rose from 185 billion to 235 billion during those same 27 years. Call it 1.27X. Finally, we have real median family income. Call it a round trip to nowhere over nearly three decades! Elliott Wave analysis, which was devised by Ralph Nelson Elliott in the 1930s, is much more than a bunch of numbers and letters placed on a chart to denote which wave, or degree of waves, the market is traversing. Those who fully embrace it say it is the only form of technical analysis that can incorporate and explain all the other techniques used by chart watchers. Walter Zimmerman at energy research firm United-ICAP, calls it the “grand unified field theory of chart pattern analysis.” Head-and-shoulders reversals, technical divergences, candlestick charts—they can all be explained within the framework of the Elliott Wave principle, Zimmerman said. Based on Prechter’s analysis of where the stock market is positioned within its wave structure, he believes the bull market is in a “precarious position.” For one, he said the sentiment indicators he follows have reflected extreme optimism for over two years. That is often viewed as a contrarian signal, because it suggests those looking to buy have already done so, leaving fewer buyers to step in if the market starts slipping. In addition, Prechter said a number of momentum indicators have been revealing a “dramatic lessening” in the number of stocks and indexes that have participated in the rally in recent months. The prime minister of Iceland said any hedge fund planning to challenge the legal basis of a planned tax on failed bank assets should think again. “If they wanted to make some kind of an example out of Iceland, to threaten people, then this wouldn’t be a good case for them,” Prime Minister Sigmundur David Gunnlaugsson said in an interview in Reykjavik on Monday. “This is founded on solid legal ground.” Iceland has tried to ensure its treatment of creditors caught in an $85 billion banking default won’t drag the island through an Argentine-like period of litigation. The island’s 2008 financial meltdown wiped out its three biggest banks after the government said the $15 billion economy didn’t have the means to save them. The economic collapse that followed forced Iceland to impose capital controls to stop investors from fleeing its markets. The island’s approach to addressing the crisis won praise from Nobel laureates including Paul Krugman and institutions led by the International Monetary Fund. Iceland’s central bank estimates gross domestic product will grow 4.5% this year, well above the 1.5% the European Commission sees the euro zone expanding. Gunnlaugsson’s administration on Monday unveiled an historic piece of legislation to unwind capital controls in place for almost seven years. But to make sure the measures don’t result in a capital exodus led by hedge funds, the island also imposed a one-time so-called stability tax of 39%. Greece and its creditors are discussing an extension of the country’s bailout program through March 2016, people familiar with the talks said, an offer aimed at breaking a protracted standoff over the terms for fresh aid and averting a Greek default. The proposal, first presented last week, is part of European officials’ efforts to prod the government in Athens to agree to painful concessions in exchange for rescue funds. But continued disagreements over the economic overhauls and austerity measures demanded by Greece’s lenders risk undermining the plan, people familiar with the plans say. The eurozone’s portion of Greece’s €245 billion rescue program runs out at the end of June, raising questions over how Athens will pay off its debt beyond this month and remain in Europe’s currency union. With a debt load close to 180% of its gross domestic product and an economy back in recession, Greece is unable to raise money from international bond markets and has been depending on rescue loans from the eurozone and IMF for more than five years. A nine-month extension would help carry Athens over its current funding gap. It would also give both Prime Minister Alexis Tsipras and his country’s creditors—the eurozone and the International Monetary Fund—more time to chart a new path for Greece’s economy. But it leaves open questions over whether the government would, indeed, be able to finance itself beyond March, or need even more support. To help keep Greece solvent over the proposed bailout extension, Greece would receive financing from some €10.9 billion in aid money that had originally been set aside to prop up Greek banks, three people familiar with the negotiations said. The measures, they said, were discussed at a meeting between Mr. Tsipras and Jean-Claude Juncker, the president of the European Commission, on Wednesday. “What we offered would mean that Greece is fully financed until March 2016,” one of the people said. In the interview in the Tuesday edition of Italy’s Corriere della Sera, Tsipras said that if Greece were forced out of the eurozone after failing to make a deal on managing its debt, Spain or Italy could soon follow, precipitating the collapse of the currency bloc. “It would be the start of the end for the eurozone,” Tsipras said. “If Europe’s political leadership cannot handle a problem like Greece, which represents 2 percent of its economy, how will the markets react to countries that are facing much bigger problems, like Spain or Italy that has a 2 billion euro public debt?” he said. “If Greece goes bankrupt, the markets will immediately look for the next victim. If negotiations fail, the cost for European taxpayers will be enormous,” he warned. Tsipras also reiterated comments made in the past few days in which he rejected demands by Greece’s international creditors to cut pensions and other social spending in return for access to the last tranche of a multi-billion-euro bailout. Tsipras feels Greece is being unfairly targeted with harsh austerity measures. But he said Greece could reach a deal if these demands for austerity were dropped. “Europe and international institutions must recognize that austerity has failed,” he said. But that is the one point the troika won’t let go of. The comments came as Greece’s international partners, including German Chancellor Angela Merkel and European Central Bank officials, have warned that time is rapidly running out. Tsipras is due to meet Merkel and French President Francois Hollande on Wednesday to try to break the impasse that has raised fears Greece could be forced out of the euro zone, with unforeseeable consequences for the single currency and the wider world economy. After dismissing the latest proposal from the EU and IMF as “absurd” last week, the leftwing government in Athens has signaled it is willing to compromise but continues to reject what it sees as unfairly punishing austerity measures. “We cannot continue with a program that has clearly failed,” Tsipras said. Greek Minister of State Nikos Pappas and Deputy Foreign Minister Euclid Tsakalotos will hold meetings with creditors in Brussels on Tuesday after sitting down with EU Economic Affairs Commissioner Pierre Moscovici on Monday. A solution to the negotiations could be reached before June 14 but further high-level meetings will only happen if there is a chance of a deal, a French government official told reporters on the condition of anonymity. Relations between Greece and its creditors have soured since last week’s talks between Tsipras and Juncker spurred optimism that a deal might be within reach. The aftermath of that meeting has been marked by mutual recriminations, with Tsipras calling the creditors’ proposal absurd, and Juncker saying the Greek leader had misrepresented the creditors’ position. Why did Greece collapse and Ireland survive? It’s a question that perplexes international policymakers, and the answers are not to be found solely in economics. First, because the Irish crisis was a banking crisis: its banks were bust, the state bailed them out and took on debts it could not sustain. Austerity was harsh – but the economy was globalised. Even as Irish banks went bust, the Irish banking sector – an unofficial conduit of money from London to the tax havens, and full of US investment banks – was still recruiting. Then there’s agribusiness. Irish agriculture, from a country of 3 million people, produces enough to feed 50m worldwide and growing. If you look at the the profile of imports and exports from Ireland to Britain, it’s much the same via mix and per-capita GDP as the trade between the north and south of Britain. In other words – hugely controversial to say politically – Britain and Ireland are close to being a single economy with two currencies. Ireland, in short, had the English language, an established role to play with the City of London and Frankfurt, and a modern, high-scale agriculture business. That is not to say austerity was popular: even now the water protests are boosting the same kind of radical left party we see ruling Greece, and boosting Sinn Fein, which has aligned itself internationally with Syriza. But in Ireland the kind of austerity enacted did not tank production by 25% and family incomes by 40%. It did not cause ordinary middle class people to vote for a party whose flags are red and methodology Marxist. And there was no mass fascist movement in Ireland. The difference is: Greece is an unmodernised capitalism where you can’t impose austerity at this level and hope to modernise at the same time. I’ve become an unwilling expert, for example, on its pharmacy regulations. Sure, the law saying pharmacies can’t open within a certain short distance of each other has been repealed, but there is still a rule that says one pharmacy per 1,000 people, one owner for each pharmacy, one pharmacy for each pharmacist. Walgreens, Superdrug and Boots, in other words, are locked out of this sector, whose opening hours are not generous. There is even a massive fight over whether newsagents are allowed to sell aspirin in Greece. To somebody who needs aspirin during pharmacy closing hours this can appear a no brainer: liberalise everything. It is exactly what the IMF has been arguing for in the Brussels Group talks, even this month: liberalise the pharmacies and bakeries or we withhold 7bn of aid and your country goes bankrupt. The problem is, the deep structures of Greek capitalism mean you can only modernise by unpicking things carefully and with consent. A population used to being seen personally by a pharmacist, to getting their drugs on informal credit when they can’t pay, just will not transform itself overnight into a midwest American consumer group. It’s the same with taxes. Hiking VAT sounds like a no-brainer in a country that needs to raise taxes. When Varoufakis proposed instead to set a low 16% top rate of VAT, on the grounds that it would undermine the culture of evasion, the IMF’s economists reportedly said yes. Somewhere along the line it got hiked to 23%. If the IMF’s negotiators wanted to give the impression their aim is to destroy most of the small businesses that keep Greek capitalism alive, and with it, consent for democracy, they are doing a brilliant job. She would do well to throw him out. But his right wing support is strong. How strong does Angela feel? A split between German Chancellor Angela Merkel and Finance Minister Wolfgang Schaeuble is widening over Greece as the funding standoff goes down to the wire, said people familiar with the matter. Merkel is ready to make concessions to keep Greece in the euro because of geopolitical concerns, while Schaeuble is willing to let the country exit the euro unless its government takes measures to ensure the country’s long-term survival in the monetary union, said the people, who asked not be identified speaking about internal party discussions. That divide is also reflected in Merkel’s parliamentary caucus, which is increasingly uneasy with letting the 41-member budget committee decide on disbursing any aid to Greece and is looking instead at a vote of the lower house of parliament on a deal that includes changes to previous agreements, they said. Greece is deadlocked with creditors over the conclusion of a multi-year bailout program expiring at the end of the month, with Prime Minister Alexis Tsipras calling the latest offer “a bad negotiating trick” in talks that place “clearly unrealistic” demands on the euro region’s most indebted member. While Merkel has repeatedly said she’ll keep working to allow Greece to stay in the euro area, Schaeuble has emphasized that the contagion risk from the country possibly exiting the bloc is “marginal.” Many lawmakers in Merkel’s 311-strong caucus made up of the Christian Democratic Union and Bavarian Christian Social Union are finding it difficult to support the chancellor’s position and would side with Schaeuble if forced to choose, the people said. Some within her caucus are discussing whether Merkel would need to tie any decision on the bailout program to a confidence vote to rally lawmakers behind her, one of the people said. Any agreement that doesn’t spell out binding reform obligations wouldn’t be accepted even among those siding with Merkel, the people said. Lawmakers from all coalition parties, which also includes the Social Democrats, object to a possible last-minute vote in Germany’s lower house of parliament at the end of the month, the last week the Bundestag is in session before the summer break, one person said. Lawmakers want time to scrutinize any proposal put before them and not be pressured to make a hasty decision, the person said. Fourteen years ago, Goldman Sachs presented a thesis that quickly gained traction among investors and policy makers: Brazil, Russia, India and China, the bank claimed, would increasingly drive global growth, filling a void left by the West. Today, the opposite case seems far more plausible. The so-called BRIC nations are now threatening to drag down the rest of the world. China’s exports declined in May for the third straight month, while imports slumped for the seventh month in a row. Asia’s biggest economy, in other words, is being hit in two directions: weak demand abroad and a sluggish economy at home. Not to mention the epic stock bubble that is sucking oxygen from its financial system. It’s not just China, though, as Gabriel Stein of Oxford Economics recently told me in Tokyo. Emerging nations have certainly hit a wall before, including Southeast Asia in 1997, Russia a year later and Argentina more times than we can count. But there are good reasons to believe today’s threat could be far more severe and lasting, including emerging markets’ higher debt levels and relatively modest growth in advanced economies. Even with the recent pickup in job creation, today’s 2.7% U.S. growth is about half the pace of the late 1990s, while the euro zone’s 1% pace is only a third of its output back then. And while Japan’s economy expanded 3.9% in the first quarter, the 30% devaluation of the yen is dampening growth prospects across Asia. The stakes are also higher now than ever before, because emerging economies are more central to the global economy. In 1999, they accounted for roughly 23% of world gross domestic product and 38% on a purchasing-power-parity basis. Today, those shares are 35% and over 50%, respectively. The BRICs alone account for about 20% of world GDP, not much different than America’s 24% in 2007, just before the global crisis. Meanwhile, developed nations are more financially exposed to emerging markets than ever before. In December, the Bank for International Settlements said emerging markets have accumulated debts in U.S. currency totaling almost $6 trillion. Johann Rupert, the South African who has made billions peddling Cartier jewelry and Chloe fashion, said tension between the rich and poor is set to escalate as robots and artificial intelligence fuel mass unemployment. “We cannot have 0.1% of 0.1% taking all the spoils,” said Rupert, who has a fortune worth $7.5 billion, according to data compiled by Bloomberg. “It’s unfair and it is not sustainable.” The founder and chairman of Richemont, whose 20 brands also include Vacheron Constantin and Montblanc, said he expects advances in technology to lead to job losses after having read books on the subject recently. Conflicts between social classes will make selling luxury goods more tricky as the rich will want to conceal their wealth, Rupert said in a speech Monday at the Financial Times Business of Luxury Summit in Monaco. Cash-strapped consumers are being shown a new place to find money: their driveways. Short-term lenders, seeking a detour around newly toughened restrictions on payday and other small loans, are pushing Americans to borrow more money than they often need by using their debt-free autos as collateral. So-called auto title loans — the motor vehicle version of a home equity loan — are growing rapidly in California and 24 other states where lax regulations have allowed them to flourish in recent years. Their hefty principal and high interest rates are creating another avenue that traps unwary consumers in a cycle of debt. For about 1 out of 9 borrowers, the loan ends with their vehicles being repossessed. “I look at title lending as legalized car thievery,” said Rosemary Shahan, president of Consumers for Auto Reliability and Safety, a Sacramento advocacy group. “What they want to do is get you into a loan where you just keep paying, paying, paying, and at the end of the day, they take your car.” Jennifer Jordan in the Central Valley town of Lemoore, Calif., lived that financial nightmare, though a legal glitch later rescued her. Jordan, 58, said she needed about $400 to help her pay bills for cable TV and other expenses that had been piling up after her mother died. She turned to one of a proliferating number of storefront title lenders, Allied Cash Advance, which promises to help “get the cash you need now.” But Jordan said it wouldn’t make a loan that small. Instead, it would lend her $2,600 at what she later would learn was the equivalent of 153% annual interest — as long as she put up her 2005 Buick Rendezvous sport utility vehicle as collateral. Why would the company want to lend her much more money than she needed? The key reason is that California has no limit on interest rates for consumer loans of more than $2,500, and it otherwise doesn’t regulate auto title loans. “She never said anything about the interest or nothing,” Jordan said of the employee who made the loan in 2012. Six months later, unable to keep up with the loan payments, Jordan said, she was awakened at 5 a.m. “My neighbor came pounding on my door and said, ‘They’re taking your car! '” she recalled. Coming to a town near you soon. “Hello Mish. Your intuition was correct about both. Harvey and Robbins are at least as bad as the five I listed in the original report. The last publicly available audited Financial Report for the City of Harvey covers the year ended April 30, 2009. In that year, the City reported an unrestricted net position of -$17.6 million and a general fund balance of -$10.4 million. The negative fund balance was equivalent to over half the city’s annual revenue. The city has provided incomplete, unaudited reports for subsequent years. The latest available report, for the year ended April 30, 2013, shows a further deterioration in the general fund balance to -$19.3 million – about 85% of annual revenues. According to the Chicago Tribune, the city’s 2014 budget also included a deficit, suggesting that Harvey’s fiscal imbalance is even worse today. Harvey’s late reporting and accumulated general fund deficit led Fitch to downgrade the city from BBB- to B in February 2010 and then to withdraw its ratings entirely in November of that year. The city has now been unrated for more than four years. No one, it seems, has had any interest in reining in the runaway housing market, a point hammered home by Prime Minister Tony Abbott last week when he expressed a desire for prices to keep on rising, despite a blunt warning from new Treasury head John Fraser. The following day, as he ramped up the notion into a political fight – Bill Shorten wants your house to decrease in value – Hockey attempted to argue that soaring house prices and affordability were separate issues. What seems to have eluded our political masters is that market adage – the bigger the boom, the more painful the bust. Then of course there is the constant moan from the business lobby; Australia is too costly, wages are too high. There is a reason for that. It’s called real estate. For the past 15 years, rents have dictated wages. Not the other way around. No matter how you measure it, Sydney and Melbourne real estate is in dangerous territory, fuelled by a heady mixture of cheap cash from foreign and domestic investors. When it unravels, the pain will reverberate through the banking system, causing enormous damage to the real economy. A major reason for the official inaction is that this is a bubble that has been deliberately contrived. In 2012, when the Reserve Bank began its easing bias, it was determined to create a housing boom – so residential construction could fill the gap created by the decline in resource project construction. But as investors, rather than owner occupiers, plunged in almost from day one, APRA and the RBA should have taken action. Instead, they were happy to watch the bubble inflate and now, rather than admit a mistake, reluctantly are playing catch-up. A large portion of the investor action emanated from self-funded retirees, taking advantage of changes to superannuation rules that allowed them to gear up their super funds. While as a nation we boast about the extent of our national savings pool, little attention has been devoted to the fact that a significant amount of that pool is now exposed. As the Storm Financial collapse graphically illustrated, the capital losses on a property market bust will be magnified by debt. That could wipe out a significant number of super balances and put more pressure on the federal budget. For even the greatest of empires, geography is often destiny. You wouldn’t know it in Washington, though. America’s political, national security, and foreign policy elites continue to ignore the basics of geopolitics that have shaped the fate of world empires for the past 500 years. Consequently, they have missed the significance of the rapid global changes in Eurasia that are in the process of undermining the grand strategy for world dominion that Washington has pursued these past seven decades. A glance at what passes for insider “wisdom” in Washington these days reveals a worldview of stunning insularity. Take Harvard political scientist Joseph Nye, Jr., known for his concept of “soft power,” as an example. Offering a simple list of ways in which he believes U.S. military, economic, and cultural power remains singular and superior, he recently argued that there was no force, internal or global, capable of eclipsing America’s future as the world’s premier power. For those pointing to Beijing’s surging economy and proclaiming this “the Chinese century,” Nye offered up a roster of negatives: China’s per capita income “will take decades to catch up (if ever)” with America’s; it has myopically “focused its policies primarily on its region”; and it has “not developed any significant capabilities for global force projection.” Above all, Nye claimed, China suffers “geopolitical disadvantages in the internal Asian balance of power, compared to America.” Or put it this way (and in this Nye is typical of a whole world of Washington thinking): with more allies, ships, fighters, missiles, money, patents, and blockbuster movies than any other power, Washington wins hands down. If Professor Nye paints power by the numbers, former Secretary of State Henry Kissinger’s latest tome, modestly titled World Order and hailed in reviews as nothing less than a revelation, adopts a Nietzschean perspective. The ageless Kissinger portrays global politics as plastic and so highly susceptible to shaping by great leaders with a will to power. By this measure, in the tradition of master European diplomats Charles de Talleyrand and Prince Metternich, President Theodore Roosevelt was a bold visionary who launched “an American role in managing the Asia-Pacific equilibrium.” On the other hand, Woodrow Wilson’s idealistic dream of national self-determination rendered him geopolitically inept and Franklin Roosevelt was blind to Soviet dictator Joseph Stalin’s steely “global strategy.” Harry Truman, in contrast, overcame national ambivalence to commit “America to the shaping of a new international order,” a policy wisely followed by the next 12 presidents. A topic that warrants much more scrutiny. You don’t need a master plan for things to go horribly awry. The push-and-pull of sociopathic leaders is unending. Their very makeup dictates that each one individually will always be vying for more. In order to achieve that, they will form subversive subgroups that will agree on a separate direction from what has been agreed by the primary group, and along the way, each one, in his lack of conscience and loyalty, might betray both the primary group and the subgroup. In the end, there’s no question that there are those who consider themselves to be part of a New World Order, as so many have publicly stated so themselves, for generations. Also, there can be little doubt that each member expects to come out of the deal as a ruler, not as one of the ruled. Further, the effort is ongoing and growing, and will result in great damage for the average person who, in most cases, simply wishes to be left alone to run his own life. It has been postulated by many that those who see themselves as an Elite are nearing the completion of what they perceive as world dominance. However, should they succeed, they will betray their partners the very next day, as it’s their nature to do so. Their behaviour would likely be that of a group of cats with their tails tied together. So, what might we take away from this discussion? First, that there most assuredly are extremely domineering forces (regardless of how closely associated they might be), which, in the near future, will do immense damage to the cause of freedom in the world, particularly in those countries where they are most dominant, or will become most dominant. Second, the situation does appear to be reaching a head. The two greatest uncertainties will be how much damage will be done before the dust has settled, and how protracted the period of destruction and struggle for dominance might be. Ultimately, for the reasons stated above, I don’t believe the New World Order concept can fully prevail, but it can and will do damage of unprecedented proportions in the attempt to implement it. Those involved will not be swayed from their individual or collective objectives (consider Adolf Hitler or Josef Stalin). The best that can be done is to work at placing ourselves as far outside of their sphere of influence as possible. This has been obvious for a while. According to leading American and British intelligence experts, a declassified Pentagon report confirms that the West accelerated support to extremist rebels in Syria, despite knowing full well the strategy would pave the way for the emergence of the ‘Islamic State’ (ISIS). The experts who have spoken out include renowned government whistleblowers such as the Pentagon’s Daniel Ellsberg, the NSA’s Thomas Drake, and the FBI’s Coleen Rowley, among others. Their remarks demonstrate the fraudulent nature of claims by two other former officials, the CIA s Michael Morell and the NSA s John Schindler, both of whom attempt to absolve the Obama administration of responsibility for the policy failures exposed by the DIA documents. As I reported on May 22nd, the US Defense Intelligence Agency (DIA) document obtained by Judicial Watch under Freedom of Information confirms that the US intelligence community foresaw the rise of ISIS three years ago, as a direct consequence of the support to extremist rebels in Syria. The August 2012′ Information Intelligence Report’ (IIR) reveals that the overwhelming core of the Syrian insurgency at that time was dominated by a range of Islamist militant groups, including al-Qaeda in Iraq (AQI). It warned that the supporting powers to the insurgency – identified in the document as the West, Gulf states, and Turkey – wanted to see the emergence of a Salafist Principality in eastern Syria to isolate the Assad regime. The document also provided an extraordinarily prescient prediction that such an Islamist quasi-statelet, backed by the region s Sunni states, would amplify the risk of the declaration of an Islamic State across Iraq and Syria. The DIA report even anticipated the fall of Mosul and Ramadi. Last week, legendary whistleblower Daniel Ellsberg, the former career Pentagon officer and US military analyst who leaked Pentagon papers exposing White House lies about the Vietnam War, described my Insurge report on the DIA document as a very important story. How to make a bad thing worse. As talks aimed at slowing global warming drag on, researchers are pushing new ideas that some are calling last-ditch attempts to avert the worst effects of climate change. Some proposals are uncontroversial, such as using charcoal to lock carbon dioxide into soil or scattering carbon-absorbing gemstones. Richard Branson, the billionaire chairman of Virgin, has offered a $25 million prize for the best solution in the field known as geoengineering. Other ideas to cool the planet have scientists worried about unintended consequences. There are proposals, untested at scale and with uncertain costs, to block the sun’s rays with airborne particles or seed the oceans with carbon-absorbing iron. That they’re even being considered reveals both frustration over government inaction and skepticism that policy alone will solve the problem. “For the last 20 to 30 years, governments, at the back of their minds, have assumed that mitigation is the main way forward,” said Mark Maslin, a fellow at the U.K.’s Royal Geographical Society. Researchers now realize that the planet needs “other urgent ways of dealing with CO2.” Interest in geoengineering comes after two decades of United Nations talks that have yet to produce a global climate-change agreement. Envoys from about 200 nations will meet December in Paris, where they’re expected to finalize a pact to curb carbon emissions. There is a sense of urgency. Researchers are seeking to limit warming to 2 degrees Celsius (3.6 degrees Fahrenheit) from pre-industrial times. “To achieve that we will have to actually do some sort of geoengineering,” Maslin said. Which is of course flatly denied. Royal Dutch Shell’s plans for exploratory drilling in the US Arctic this summer will involve the harassment of whales and seals by the thousands, an application document filed by Shell to the National Marine Fisheries Service (NMFS) reveals. Most notably, Shell estimates its Arctic activities will expose more than 2,500 bowhead whales, more than 2,500 gray whales and more than 50,000 ringed seals to continuous sounds and pulsed sounds, deemed damaging enough to constitute harassment. The bowhead whale is listed under the US Endangered Species Act. By Shell’s own estimate, 13% of the overall population of bowhead whales still alive are potentially harassed . The number of gray whales potentially harassed also constitutes 13% of the overall population, while the number of ringed seals potentially harassed amounts to 16%. Under the ESA, the ringed seal is classified as threatened. Under the Marine Mammal Protection Act, the government may allow for the “taking” or “harassment” of marine mammals, so long as the number taken is small and the impact on the species negligible. But environmental groups argue the numbers affected by the Shell plans are not small, nor will the impact on species be negligible. “The authorisation that they [Shell] are seeking is a request to be able to harass that amount of animals. Shell has asked the government to authorize the taking of that amount of animals,” said Christopher Krenz, a scientist and Arctic campaign manager with Oceana. The influx of undocumented immigrants into Greece from neighboring Turkey has increased dramatically, growing sixfold in the first five months of the year compared to the same period in 2014, according to new figures released by the coast guard on Monday. A total of 40,297 immigrants and refugees were intercepted in the Aegean, particularly on the islands of the eastern Aegean, between January 1 and May 31 as compared to 6,500 in the same period last year, according to coast guard figures. The influx is continuing, and is expected to intensify as the weather improves. Coast guard officers detained 4,046 migrants over the weekend (including Friday). The problem is more intense on some islands, such as Lesvos, which received 18,371 immigrants in the first five months of the year. On Monday alone two boatloads carrying a total of 78 would-be migrants arrived on the island’s shores. The situation on Chios, Kalymnos and Kos is said to be just as bad. A total of 7,317 migrants arrived on Chios from January to June. The island’s mayor, Manolis Vournous, said authorities have set up a makeshift camp outside the main police precinct as temporary accommodation for hundreds of migrants. Similar stopgap solutions have been sought on other islands. On Lesvos, a drivers’ education center has been transformed into a temporary settlement for migrants. The islands of Samos and Kos, which are popular summer tourist destinations, have also been struggling, having received 4,658 and 4,625 immigrants respectively in the first five months of the year. Works are under way to repair an abandoned hotel on Kos that suffered serious damage in a recent fire. It will be able to accommodate around 400 migrants once works are complete, local authorities said. A spokesman for the Citizens’ Protection Ministry told Kathimerini that 80% of the incoming migrants are refugees from Syria, adding that Greek Police has boosted personnel and equipment to accelerate the identification process. Last Friday, the United Nations refugee agency said it is boosting its staff presence on several islands in the Aegean.